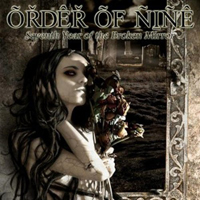 ORDER OF NINE is a Progressive Power Metal band that comes from the United States, they were formed in 1997 under the name of TEMPLAR they released an album called “A Touch of Winter’s Discontent”, later in 2001 they would release their debut album as ORDER OF NINE, called “Of Once and Future Kings”, and then following with “Seasons of Reign” and “A Means to Know End”. “Seventh Year of the Broken Mirror” is their fourth release as ORDER OF NINE. Let me first start by stating that I have never listened to anything of theirs prior to this album so I can’t really say if the reason why I didn’t like this album is an isolated incident or is the mark of this band, this problem being Michael Degrena’s vocal style, a very bland, boring as hell vocal style that has the ability to decrease the quality of the songs which, otherwise, would have had the potential of being Power Metal classics. The instrumental work that Howard, Boord, Pollick, Kreh, Dillon do is superb, great riffs, great solos, with special mention being made to “Changing of the Guard” with its middle-eastern touch and the ballad “Innocence”. This had the potential of being a tremendous record but due to Degrena’s bland and boring vocals it managed to bring a 9-rating album to a 6-rating album.